Introduction to Seoul Food Girl! Outside of Manna Korean BBQ where they taped my restaurant review inside of their window! I was so excited, only I wish my eyes were open in this photo! Now that I'm finally settled in Seoul, I am ready to continue my passion for writing about food! This is my second blog about Seoul; my first blog is about Seoul's culture and can be found at www.goneseoulsearching.com. I believe this food writing journey all began in my college newspaper, with my first food column titled "Confessions of a Sushiholic." I was bored and tired of seeing the same old restaurant reviews, so I decided to start the column to spice up the A&E section. 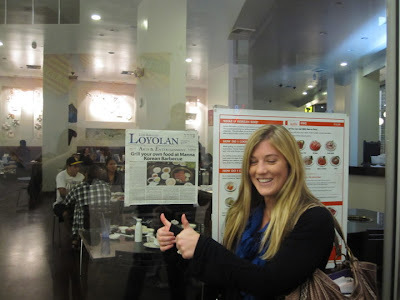 There is no better way than to start this blog than with my first Sushiholic article, and my last article from the Los Angeles Loyolan's 2010 Commencement Issue. The commencement article sums up a few of my favorite things about working for the newspaper in college. Of course, its all about food and my love for the food paparazzi! Unfortunately, most of my articles have been deleted from The Loyolan's archive due to a new website remodel in September of 2010. I was not able to copy the direct link of the commencement story, but luckily I still have the original version saved on my computer. Both of the articles are uploaded below and I hope that this will give you a better idea of why I like to write about food! Kanpai is most likely the only sushi restaurant in L.A. to name a roll after LMU. You have no excuse for eating sushi from the Lair because this Japanese sushi bar and grill is located right up the street from LMU on Lincoln Blvd. Not to mention they are open seven days a week with a lunch menu, to-go menu and party plate menu, and have over 20 types of sake on the drink menu imported from Japan. Although the outside of Kanpai may be less than thrilling, due to the fact that it is located near a Quiznos on one of the busiest streets in L.A., the inside is not. The interior of the restaurant has an upscale atmosphere, but attire can be casual or dressy. Kanpai is perfect for all budgets. 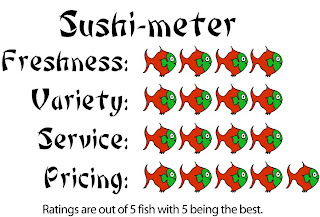 If you are looking to stay within a low price range, make sure to go between 11:30 a.m. and 6:45 p.m. for the ‘Early Bird Special Menu.’ If you are celebrating an anniversary, or if your parents are in town to take you out to an expensive birthday dinner, Kanpai is an easy place to rack up those dollar signs. Unfortunately, the LMU Roll weighs in at a steep $15 on the special rolls section. One would think that since they named it after a college, they would give it a more reasonable price. But surprisingly, only five minutes after ordering the LMU Roll from the sushi bar, I was thinking about ordering another one! If all you order from Kanpai is the LMU Roll you will be filled with sushi happiness all day long. 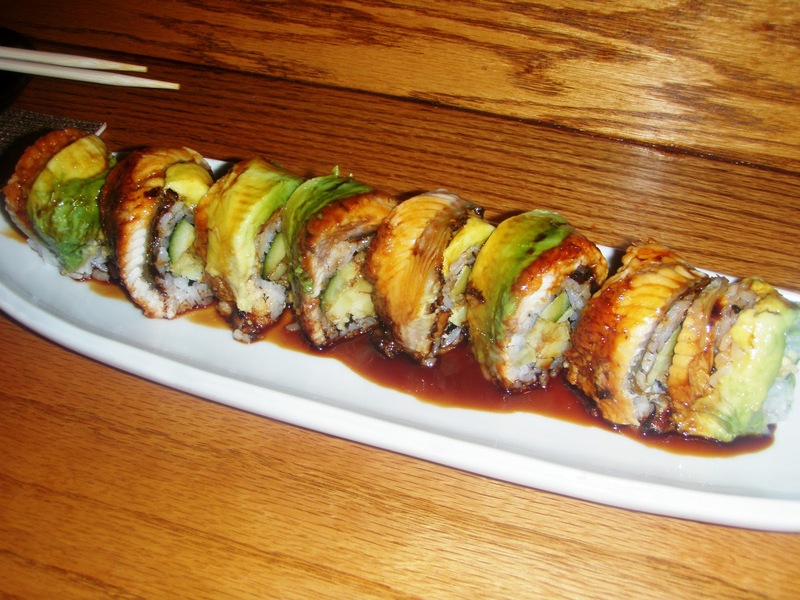 The roll is topped with eel and avocado and is stuffed with a mixture of deep-fried potato, cucumber and crab meat. There is a sweet eel sauce poured over the roll, which perfectly complements the dish, leaving no need for soy sauce. What college student doesn’t like anything deep-fried? My waiter said that they came up with an LMU Roll to satisfy all of the students and faculty members who visit on a regular basis. Kanpai also has an OTIS Roll available but it costs $1 more than the LMU Roll. I like to think it’s because they like LMU students better. One amazing twist on college food turned into sushi is the pizza roll. I admit that anything with pizza and sushi in the same sentence sounds a little repulsive, but once again, Kanpai succeeded with their innovation. The Pizza Roll comes with six pieces of ’sushi’ made of mixed crab, scallop, shrimp and salmon, all baked over sushi rice. The flavors of the four different seafoods mix together brilliantly, and a fresh cherry tomato on top adds to the freshness. Order the Pizza Roll from the ‘Early Bird Menu’ for only $5. 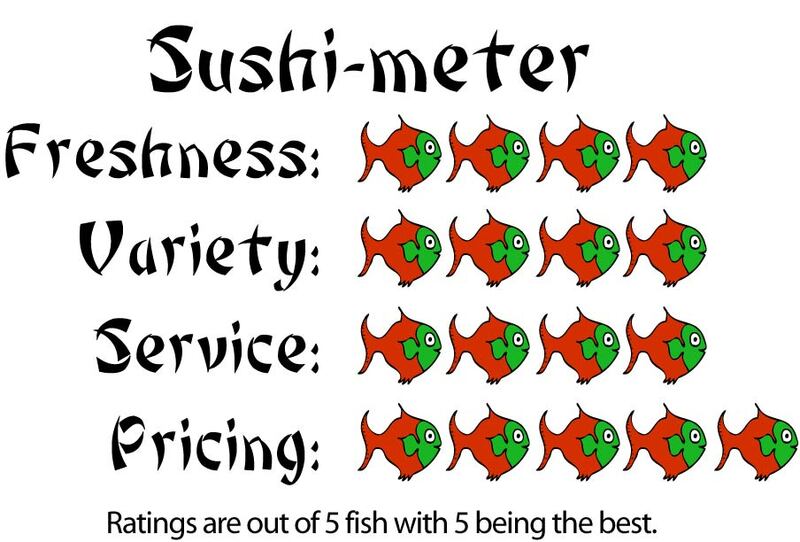 If you really want to save money on sushi at Kanpai, here is a hidden secret from an expert: Order the party sushi plate for $58 two hours in advance, and split the bill among you and three of your friends. If you haven’t brushed up on your math skills lately, the bill will only run each person around $15 and the plate has at total of 47 rolls. That’s more than 11 pieces of sushi each for a group of four people. One of the most interesting things at Kanpai is not the menu itself, but the sushi chefs. Most sushi chefs are traditionally male, but at Kanpai, there is one woman who works there who knows what she is doing. Be careful though, because she might try to sell you a $30 Kanpai New York Steak Dinner after you’ve already ordered $50 worth of fish. Happy Sushi! For day’s my mind endlessly wandered as I thought about what to write for my final article in The Loyolan. Between having no motivation for studying for finals, and the blinking cursor on my Microsoft Word document, all I could think about was food. Then suddenly at the Loyolan Banquet dinner everything became clear. "Thanks Tom." Every year our advisor Tom Nelson comes up with personal awards for each graduating senior on the staff. They are usually pretty humorous, and capture the essence of senior’s contributions at the paper. The second the “I was always hungry whenever reading any of her articles” award was announced, of course I knew it was for me. The funniest part of the award is that Tom said he was hungry as soon as he saw my name on any byline, even if I was writing about an upcoming guitar concert. With all of this in mind, I would like to say a personal farewell to the A&E section of The Loyolan. I wrote a total of 16 articles solely on food, and they were always my favorite to write. My passion for writing about food will not stop with this article. Upon graduating and moving to Seoul, South Korea I plan on beginning a blog titled “Seoul Food Girl.” Hopefully it will continue to make other’s in Seoul just as hungry as Tom. The most heated discussions during The Loyolan’s production hours were often about choosing a title. Sometimes people would get crazy after thinking about headlines for over 4 hours and even more often they would get shut down by our EIC Jose Martinez. We never had that problem with food titles. Between “Solely Guacamole,” “Holy Hot Dog!,” and “Confessions of a Sushiholic,” everyone was starving in the office. Today writers have actually managed to make a living from food blogging. Of course the most well known is NYC Food Guy Lawrence Weibman. Food blogging has gotten so popular that two weeks ago The L.A. Times wrote an entire article about the food paparazzi and its effect on angry chefs. One of my favorite quotes from the article is from chef and owner Ludo Lefebvre when he remarked “This is the game we all now play. We cook, we smile -- and the people, they don’t eat. They get their cameras.” So thanks Mr. Lefebvre, we like any kind of feed back in the journalism world. When choosing my last camera, of course I wanted one of those new waterproof and shock proof ones because they are virtually indestructible. But one of the deciding factors on choosing this new camera was of course cuisine mode. Yes, my camera has an entire mode just for taking pictures of food! Besides being completely awesome, this camera feature truly allowed me to capture the essence of food throughout L.A.. Now food writers have no excuse not to have amazing photos when they can secretly capture food bliss without a flash blinding the angry chef. You can’t complain about eating out when you know that you are saving money. Many places will give you discounts if you tell them you are writing an article about their restaurant. One time I received two mammoth sushi rolls courtesy of the chef when my waiter told him a student was writing a review for their college newspaper. Another time I brought a review I had already written along with me to a food truck and received a free midnight snack. But one of the most rewarding things about food writing is the excitement. For foodies across the nation, whatever is on our plate is the main star of the show. The last time I went to the movies was in January, and I could care less about Angelina Jolie’s next box office hit when there is a succulent piece of lobster on my plate.